McCain was also one of the country’s most prominent voices on the international stage. He was a staunch proponent of the U.S. military intervention in Iraq and Afghanistan and urged muscular American responses to global crises all over the world, from the civil war in Syria to Russia’s annexation of Crimea. This stance earned him the ire of dovish liberals and libertarian-minded Republicans who considered him a warmonger, but also won him wide respect from defense hawks. At the same time, McCain was a leading champion for human rights. He organized numerous congressional trips to meet with foreign leaders and dissidents alike. A victim of torture during the Vietnam War, he became the Senate’s top anti-torture advocate, teaming up with Sen. Dianne Feinstein (D-Calif.) to outlaw brutal interrogation tactics used by the CIA under former President George W. Bush. He and former Sen. John Kerry (D-Mass.) also helped reestablish U.S. relations with Vietnam during the 1990s. The two men, both of whom served in the war, famously traveled back to Vietnam together in 1993, including making a trip to the “Hanoi Hilton,” the prison where McCain was held. He spent nearly six years as a prisoner of war in several camps. In 1954, McCain entered the U.S. Naval Academy, as did his father and grandfather before him. “I remember simply recognizing my eventual enrollment at the Academy as an immutable fact of life, and accepting it without comment,” he wrote in an autobiography. Then came the war in Vietnam. 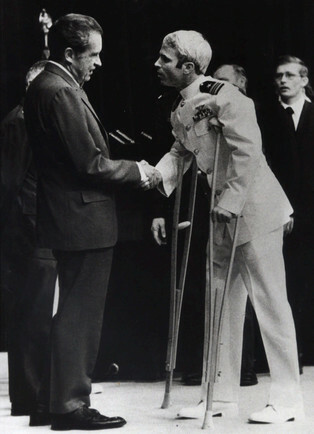 While on his 23rd bombing mission on Oct. 26, 1967, McCain’s plane was shot down over Hanoi. Both his arms and his knee were shattered. He was stabbed with bayonets by a mob that pulled him out of the lake where his plane crashed. 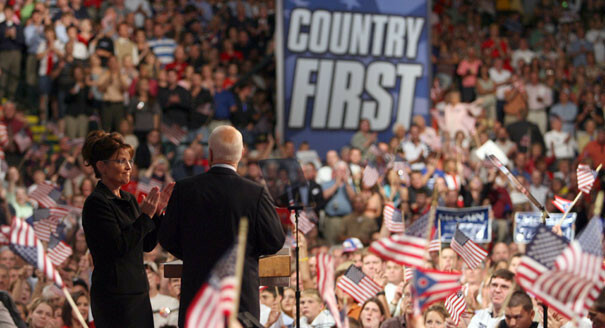 McCain made his first run for president in 2000, when he faced off against George W. Bush for the Republican nomination. On the campaign trail, McCain gave reporters unfettered access to his campaign bus, called the “Straight Talk Express,” and held more than 100 town halls in New Hampshire. McCain won the state but would go on to lose an ugly primary fight in South Carolina, sapping momentum from his campaign and leading to his withdrawal from the race after Super Tuesday. Dragged down by Bush’s sagging poll ratings and an imploding U.S. economy, McCain was defeated handily by Obama, losing in the Electoral College by a huge margin. Yet both men supported big increases in spending for the Pentagon, and Trump quickly signed into law the defense authorization bill authored by McCain as one of his last acts as a senator.